The architectural history of the Lower Ward of Windsor Castle is one of construction and demolition. Since the later years of the reign of Henry II, when it was the location for a new royal palace, the site has evolved into what today stands as a unique collection of buildings. Nowhere is this more evident than in Canons’ Cloister and, in particular, 6 Canons’ Cloister. With its timber-framed range jutting proudly out into the cloister garth the building would, in Henry VIII’s time, have been perhaps the finest of all the canons’ homes. Lying between the Dean’s Cloister to the south and the north curtain wall of Windsor Castle, Canons Cloister was largely built between 1352 and 1355 to accommodate the twelve canons and thirteen priest-vicars of the College of St George. Accommodation originally consisted of between twenty two and twenty six bays providing rather cramped quarters for members of the College. 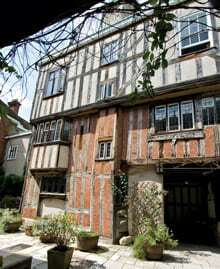 In the early 15th century the priest-vicars left to occupy new accommodation, in the Woodhaw (an area to the east of the Vicars’ Hall), allowing the canons to expand their homes into the newly vacant lodgings. Indeed, the Treasurer’s roll for 1415-1416 records that money was spent ‘in making new in the cloister of the canons’. Number 6 is situated on the north side of the cloister, built against the Castle’s curtain wall with views out towards Eton. The building would once have been a fine home for a canon. In the early sixteenth century the distinctive extension that we see today was built, transforming number 6 into the most impressive home in the cloister. We can only hypothesise about early occupants but one might well have found Thomas Wolsey, soon to become the most significant canon of his day, living there from 1511 to 1514. Certainly the design of the extension draws comparison with Hampton Court creating the intriguing possibility that it may have been completed for Wolsey. The College Archives contain numerous documents relating to the canons’ homes, including two ‘income books’. These manuscript books provide a list of the occupants of number 6 from 1678 and continuing for the following 250 years. The books themselves record the movements of canons and the payments they made for fixtures and fittings like wainscott as they entered a new house. From these documents we can see that the noted European scholar Isaac Vossius occupied the house in the 1680s. 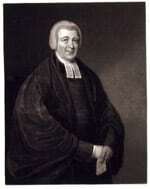 Later, in 1820, old links with Eton were maintained when the school’s headmaster and then provost, Canon Joseph Goodall, moved into the property. Plans in the Archives demonstrate that circa 1840, shortly after Goodall’s occupancy, numbers 6 and 7 were combined into one even larger property. Also to be found in the Archives are a series of documents recording the 1960s restoration work undertaken by Seely and Paget. 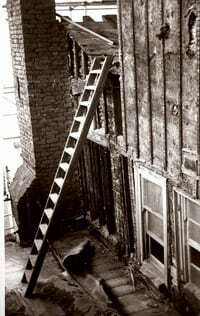 In 1967, during works on 5, 6 and 7 Canons’ Cloister, number 6’s Tudor façade was uncovered. Previously enclosed by a grey render, the original timbers were preserved and the distinctive herring-bone patterned brickwork was inserted, restoring the extension to something of its former glory. 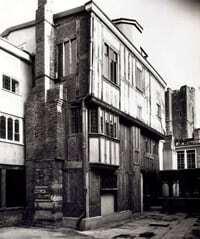 Attracting a great deal of interest from the then named Historic Buildings Council, work was undertaken to sure-up what was described in the 1967 Friends’ Report as a ‘shaky structure’. Similarly preserved at this time was the only complete section of the original timber arcading in the cloister. Now visible on the right-hand wall as one enters the building, this is a truly remarkable and unique survival. As a new generation of canons take up the challenge, and great pleasure, of custodianship of the Lower Ward’s historic buildings, we might only speculate as to what discoveries are yet to be made in the future. Documentary evidence and recent dendrochronological analysis have suggested that timber used in the construction of number 6 may have come from the same wood (Cagham Wood) as Edward III’s timber residence within the Round Tower. Should this, for example, be confirmed it would tell us a great deal about the constructional sequence of Windsor Castle as a whole. Clearly we still have a great deal to learn about a building that has already stood for over 650 years.